CUE THE mental rewind and participate in a game of What If? What if Hollywood Basic had released Charizma and Peanut Butter Wolf's debut album Big Shots back in 1993? Some possible outcomes: Hollywood Basic owner Michael Eisner gets a hit record that saves the label and artists from the chopping block. The South Bay duo plays Arsenio Hall, tours the world and becomes the West Coast equivalent of Pete Rock and CL Smooth. Charizma's hometown, Milpitas, loses its reputation as the Gateway to Fremont, inspiring A&R reps to flood the city and Japanese hip-hop heads to make pilgrimages to Milpitas High to see where Charizma sharpened his battle chops. And maybe, just maybe, Hicks doesn't take a wrong turn down an East Palo Alto street in December 1993 where he was shot and killed. The tragic end of Charles "Charizma" Hicks' life earned a blot on the obituary sheet that rearranged the words "rapper," "gun," "murder" and "streets" from the previous week but didn't fully convey just who Charizma was. The posthumous release of Big Shots fills in the backstory of a promising rapper cut down before his time. Big Shots is the lost album from Charizma and Peanut Butter Wolf, containing 15 recordings from 1991 to 1993. Hollywood Basic never released the record, viewing the two as anomalies to the gangsta rap explosion. To play catch up, the label tried to toughen the group's image with suggestions right out of CB4. Seeing the fit wasn't right, the duo broke out of its contract and pondered its next move. Hollywood Basic sat on the album and released the single "Red Light/Green Light" on a promo cassette single with a track by the Lifers Group--a rap crew with actual jailed inmates--on the flip. 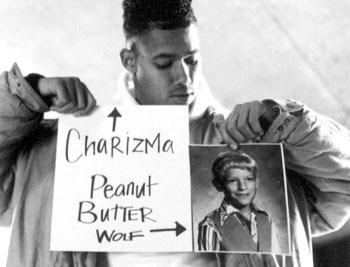 It's a good thing that PB Wolf and Charizma held on to their down-home personas. Officially released in January on PB Wolf's Stones Throw record label, Big Shots captures the duo in a crisp screen shot, creating music with a giddy, early-'90s aesthetic. Listeners are drawn into the lyrical complexity before hitting sharp turns via the sample-heavy, wanderlust production techniques. Charizma sounds like MC Shan blessed with youthful lung capacity while PB Wolf makes like Marley Marl programming beats in DJ Premier's lab. He loops drums, stitches phrases, scratches punch lines and roasts snares until caramelized. Big Shots is full of songs that would never make KMEL's playlist today. "Jack the Mack," "Here's a Smirk," "Ice Cream Truck" and "Red Light/Green Light" sound almost quaint, full of clever motifs, metaphors and wordplay. "Methods" hails from the same introspective shelf as Gang Starr's "Ex Girl to the Next Girl" and Wu-Tang's "C.R.E.A.M.," with lackadaisical tempo and lyrics concerned with issues of temptation and furthering insight. If released back then, "Methods" would have stood strong next to Bay Area hip-hop anthems of the day, like Hieroglyphics' "Cab Fare," Souls of Mischief's "93 Til Infinity" or Blackalicious' "Swan Lake." After Charizma passed, Peanut Butter Wolf put away his sampler, temporarily retiring from making music. He wanted to release Big Shots to honor Charizma's legacy, even shopping the tapes to labels, but nobody wanted to capitalize on a tragedy--strange, when 2Pac has more gold records now than when he was alive. Soured by the Hollywood Basic experience and sobered by the passing of his MC, Wolf founded Stones Throw Records in 1996, a label dedicated to preserving artists' creative freedom. Its first release was Charizma's "My World Premiere," a consistent seller in the catalog earning multiple repressings. Stones Throw has issued many hits since then--Madlib, Quasimoto, Rasco, Lootpack--and has enjoyed success in reissuing obscure early-'70s funk records, but releasing Big Shots would have to wait for the right time. With 1993 growing smaller in the rear view, the record, like a throwback jersey, is a replica of quality frozen forever in time. Peep one of the most slept-on South Bay rap duos, discover anthems that never were and play your own game of What If? From the February 12-18, 2004 issue of Metro, Silicon Valley's Weekly Newspaper.